Portrait of a lady in blue with yellow dress, the lady has beautiful eyes with dark brown hairs. 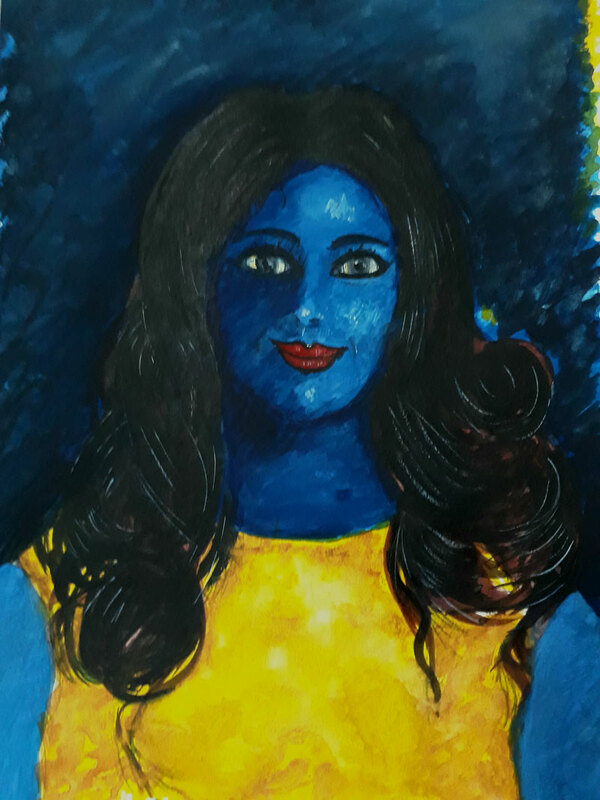 I used the blue color for the body and the yellow for the t-shirt, the reason behind this over all color composition is that women conserve all the sorrows and spread happiness to all. The world cannot deny the tolerance power of women has. Women are a sun rise for all new things in your life. Beautiful glittering eyes are indicating brightness, saying that wake up and start your day with new thoughts and forget about sorrow, and give me all your grief and take a beautiful smile from me. Illustration or graphic on visual communication. In this I try to create some images by using typography written as communication. Here V is like hen bird, i is like any character, and L i used as a relax point where a person sitting and reading newspaper. I used bold letters to create an effect of visual communication itself. O used as foot impression of a lion, M created like a dear and again M symbolize elephant here, in C you can imagine a dog face with big ear, T created as a bull head with horns, and O shaped as a fish and rest of letter written in a bold way you can see. 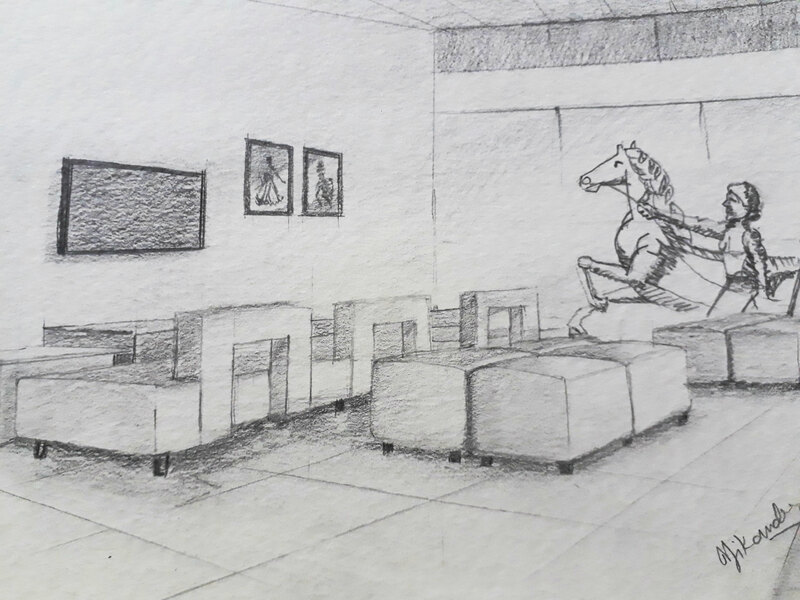 I did this just to attract viewers and wanted to communicate message that this is visual communication where you can attract and send message in a very interesting way. It is a brief introduction about visual communication, Visual communication is a method of exchanging information and ideas through visually appealing imagery and symbols. It also include the photographs, illustrations, graphics, film, typography, gestures ect. and many other mediums are available to communicate your message. It is just like sending and giving information in an interesting way in which people can take interest or participate. There are three types of communication. Visual communication design: It is a brief introduction about visual communication; Visual communication is a method of exchanging information and ideas through visually appealing imagery and symbols. It also include the photographs, illustrations, graphics, film, typography, gestures ect. and many other mediums are available to communicate your message. It is just like sending and giving information in an interesting way in which people can take interest or can connect and interact. Visual Communication: Image, illustration, photograph, film, gestures, expressions etc. Non Verbal Communication: tone, gestures, face expressions, body language etc. However People rely on the visual communication most, and believed to be the best method of communicating each other. Studies show that almost 10% -12% people remember what they hear, 20% – 25% what they read and 70%-80% of people remember what they see. So you can understand which is the most interesting way of communication. There are several models of communications and theories are available which developed by various people and philosophers. In this theory in which people or a message sender send the message to the receiver or public. Receiver can be a single person or a group of people, those receive the message from sender. It is a simple and straight kind of communication; apply in mass communication i.e. political leader speech, radio, television, newspaper, magazine etc. In these theories the message sent by sender and receiver can reply back. It also add feedback. Interactive model of communication allow people to reply back so sender send the message and receiver receive it, here receiver reply back so receiver become sender and sender become receiver. (the method reversed) i.e. someone send message to his known and he reply back. Technology changing very fast and currently we are using several apps with mobile phone to interact people. This theory says face to face interaction each other, ih this model the sender of message and receiver can react in the same way at the same time i.e. facial expression interaction, verbal arguments, noise ext. Interviews, tv debate etc. come in the transactional model of communication. We should consider these 7C’s to make communication more interesting and better.